The boy has been raving about this particular massaman curry paste from one of the Asian grocery shops near his house. Last week he brought me my own container. Yum. I made a regular four-serving batch, as directed by the instructions on the curry paste, complete with tofu, potatoes and onions, and these are my leftovers! I have been eating this all week, and it is delicious. Today marks the start of April, but it also (and more importantly?) is the first day of the WEBS anniversary sale. As this blog post’s title implies, I’ve already clicked the “complete purchase” button, and a healthy dose of eco-wool (for a hemlock ring blanket, an owls sweater, and maybe linden or shalom), as well as some classic elite silky alpaca lace (ishbel is building my lace confidence) and some jo sharp dk wool (for bracken) should be en route to my doorstep soon. Speaking of ishbel, my version has graduated to “blob” status. It is too big to stretch out all pretty on its circular needle, so here it is in a big heap. I’ve finished the stockinette portion for the large size, which means it is time for lace. Wish me luck! newsflash: yarn pile is becoming a mountain. 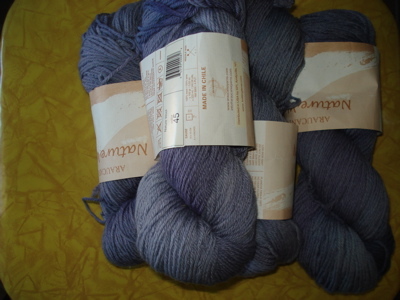 First up, a spontaneous yarn purchase. I have yet to make my first Clapotis, and I decided not to buy the Lion and Lamb because I could not rationalize the cost. 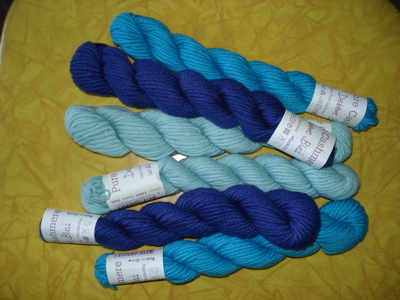 And then…an angel posted this yarn on Destash. 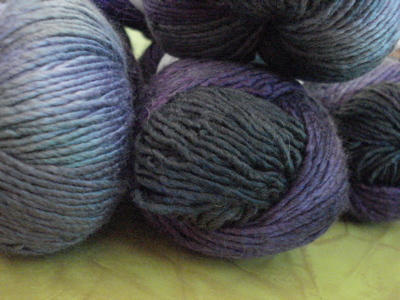 I got a very nice deal on it, and this colorway, Black Purl, is exactly what I would have purchased for myself. I am excited about this, but I think it will have to wait until after all of my holiday knitting. 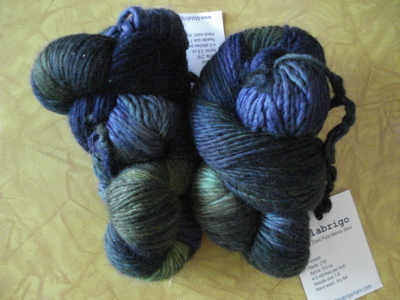 And more Malabrigo. 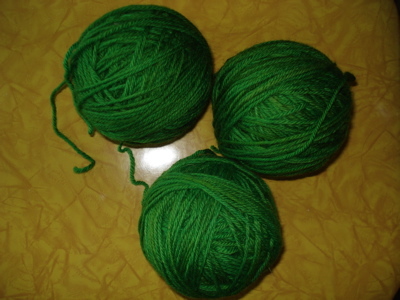 I think both sets of skeins are destined to become My So Called Scarf — one for me, one for a dear dear friend. Berocco Peruvia. What could this be for? Is it tilted? I think so. 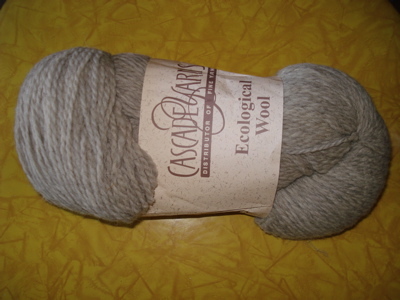 A massive skein of Eco-wool, intended to be the main color of multiple mittens. 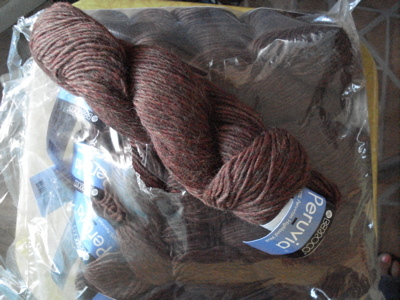 This purchase is Ravelry’s fault. 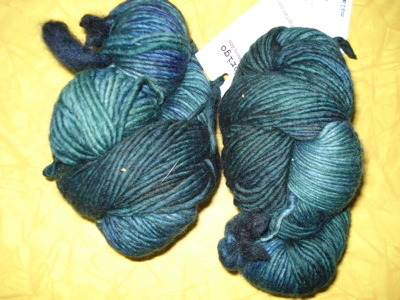 I have 3 skeins of a turquoisey shade of Nature Wool, and was looking to find uses for it. I found too many, and decided that since I’d like to make multiple gifts a la Calorimetry with it, I would need more in order to make Fad-Classic. Notes on my holiday knitting to come. 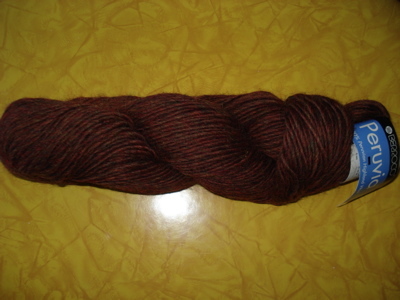 Also, I am participating in my first ever swap, over at the Fall Fingerless Mitts KAL. I am very excited — but right now, I am also very sleepy. The whole “falling back” part of daylight savings has me exhausted.